9th August, 2015 – For a complete coverage on the march check out Jan Bowman’s report in the Westender. Three hundred people from the Kurilpa Peninsula and from suburbs further afield across Brisbane, such as Calamvale, Newmarket, Red Hill, The Gap, Toowong and Woolloongabba, marched and rallied today to demand better planning from Council across our city. 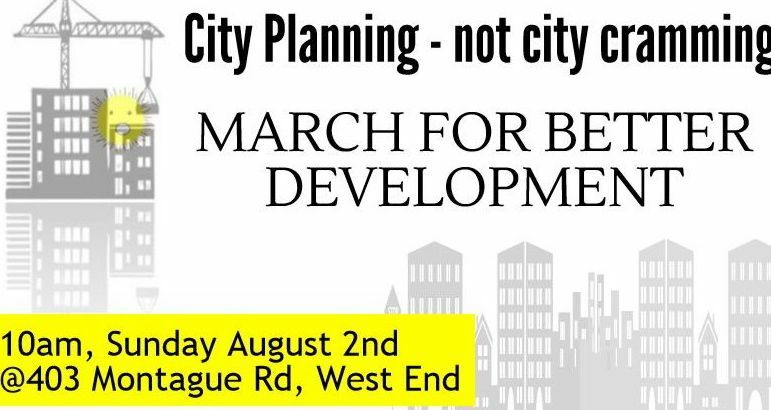 The march went from opposite the former School of Distance Education, now part of a development of 1000 plus units, down Montague Road, Jane and Boundary Streets to the small plaza outside the Commonwealth Bank, opposite the proposed redevelopment of the former Peters Ice Cream Factory, with again in excess of 1000 units proposed. The good humoured, but strongly committed, crowd demanded better planning, a review of the local plan to ensure sustainable densities of development, adequate and necessary community infrastructure and open space. They also demanded an end to Council relaxations of heights and densities of development which have made the City Plan a useless scrap of paper in the experience of so many residents and communities. The colourful and vocal march attracted great attention and support as it wound through the heart of West End. Although Council has not listened to the concerns of local communities for years now, perhaps the next seven months as we approach a Council Election in March 2016 may see a sharper, more motivated reason for the Lord Mayor and his Administration to now start listening to residents. The rally had some great speakers including Dr Erin Evans, President of WECA; Jonathan Sri, Greens Spokesperson; Jo Bragg of the Environmental Defenders Office; Adjunct Associate Professor Phil Heywood, eminent academic and long term friend and advocate of strong local community participation in the planning process; and well respected local Councillor for The Gabba Helen Abrahams. That this assembly demands that the Lord Mayor and his administration guarantee a review of the current 2010 South Brisbane Riverside Neighborhood Plan and replace it with a new Neighbourhood and Community Plan which reduces the proposed density of development to sustainable levels that can be serviced by effective and funded transport, physical and social infrastructure plans and provision of public open space, developed in cooperation with the relevant City, State and Commonwealth government departments. That this assembly demands that the Lord Mayor and Brisbane City Council base the reviewed plan on systematic consultation with the local community through open collaboration with community groups.